Carpet Cleaner Rental versus Professional Carpet Cleaner, Which Is Better in Lafayette, CO 80026? The following article describes how a couple tried using both a Rug Doctor AND a professional truck mounted steam machine in their home. 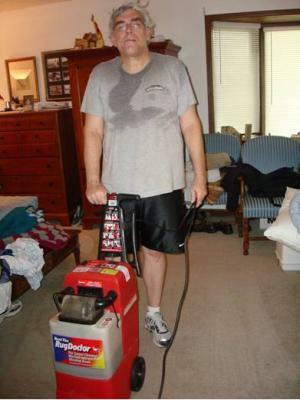 Title: Carpet Cleaner Rental or Professional Carpet Cleaner, Which Is Better? See many more articles like this at Interesting Articles for You. One of the perks for working at a carpet cleaning company is we get to take the truck mount home and take care of our own floors and furniture. This is great because my wife and I have 3 kids, 2 dogs, 3 cats, a bird, and live on a gravel road. So, we need a good carpet cleaning every few months. Before I started working here my lovely bride decided to invest in a Rug Doctor to take care of this herself. Silly girl! So, the dogs had a couple incidents when the kids forgot to let them out of our bedroom one day when her and I were away from home. Anyway,we have had a busy schedule here a MasterCare. Even some commercial accounts and other obligations took up weekends and evenings for the van. The wife was getting impatient to treat those spots and the carpets were starting to look a bit well traveled. While I was at work one day she rented a Rug Doctor and went to cleaning our bedroom carpets. When I got home that evening I got blasted by a musty smell as I walked in the door! My bride came out of our room all proud of herself for “cleaning” our carpet. I felt so bad for her for working so hard and having that smell come out of our room! She said the smell was worrying her. Rightly so, the carpet was very damp! I tried to get more water out of the carpet with that little orange machine to no avail. See a video comparison of a Rug Doctor machine versus a truck mounted steam cleaner here. We turned the ceiling fan on and put a couple other small fans on to help it dry faster. Next morning it was still wet! ewww! I brought home some products and air movers from work that evening to treat the odor. It got a little better that evening and the next day, well maybe I just got used to it. The next evening when I arrived home the odor was still there…not as bad, but still noticeable. So this last weekend I made arrangements to bring home the MasterCare van! Working here and there with Mark and Ben I have learned quite a bit on what chemicals to use, how to apply them, and how to extract. I (reluctantly) recruited my 2 sons to help me with pre-vacuuming the whole house and moving furniture around to get started with a good deep clean. I showed them things I learned and why it’s done. The boys seemed to get a little interested (I mean …a little). We worked on all the carpets in the house and our large microfiber sectional. It might have went faster if I didn’t have to show them things and stop what I was doing to point out things more specifically, but I remembered the patience Mark and Ben showed me. I wanted them to feel like they learned something and helped me as well. They were troopers…lol. The sectional took longer to clean than the rest of the house, so we extracted on it first and got the air movers going on it. Then off to the floors….Needless to say, as we did our bedroom, we could see what the Rug Doctor didn’t get, it smelled fresh, and it was almost dry by the time we started on the next room, too! My wife was impressed! When the carpets were cleaned we went back and applied Scotchguard on everything we cleaned and my oldest groomed it all in. Everything feels brighter, fresher, healthier, and cleaner! DIY or get a professional? Your decision, but I can see firsthand what powerful equipment, safe chemicals, certified training and proper technique are worth! And so can my DIY wife now! NO back breaking work or soaked, moldy carpet. Try us for FREE!